tomorrow is a VERY big day and I thought I would share what I am about to take on. At IMMT I qualified for KONA (as a lot of you probably already know) and tomorrow I will be racing in the Ironman World Championship in Kona. It is an absolute DREAM come true!!! I believed I could qualify for Kona at IMMT and I made it happen. Hard work really does pay off and I am here racing in Kona because I belong here. I earned this and I can’t wait to race out there tomorrow with everyone else who has worked so hard to be here. Special thanks to Team Coeur for being so awesome here in Kona ALL season long!! Also a big thank you to Coach Jorge from E3Training Solutions who helped get me to the Big Island. Looking forward to the big dance tomorrow and having the best day of my life. You only get one “first kona” and I plan to take it ALL in, while racing very smart. It’s going to be an AMAZING day!!! You can track me tomorrow on ironman.com. There will be a live tracking site all day long, including a GPS tracking, where you can see my every move on the course (how cool is that?!). Tomorrow I’ll be running my third consecutive Boston Marathon. Two years ago was my first Boston and my first marathon EVER. It was 2013, the year tragedy struck our city and our race. Having run the race that year, and being from Boston, it’s something that I will never forget. It took weeks for me to feel happy about my accomplishment that year, I just couldn’t think about anything else than the awful events that happened. I ran the race in 3:28. I ran a smart race, doing a ‘negative split’ and running my second half slower than the first half. This is the ideal way to run Boston. This year… I feel the best I’ve ever felt before. If all goes well, tomorrow should line up to be a great race! The weather looks, um, not so pleasant. But that’s ok, I’ve trained in the cold, the snow and the rain. I’m pretty much ready for anything mother nature sends my way. I will have fun out there no matter what! It’s supposed to be in the low 40’s to start, with rain beginning shortly into my run. Boston has a late start and I’ll be starting around 10:30 AM. The rain is supposed to continue throughout the entire race, getting steadier and steadier as we go. Along with the rain, it will be nice and windy… well it’s a good thing I won’t be on my bike! I START at 10:25 AM from Hopkinton ! Sign up by texting my bib number (13114) to 234567 or download the BAA Boston Marathon App and search my name or number. You can also track on baa.org on race day! Thanks for all the virtual cheering… it means the world to me!! So hard to believe I am in the teens when it comes to weeks counting down to IMMT! Time is flyin’ by! Last week was a very successful week of training. I had the week off from work (in between my old job and new job), so this gave me lots of time to train on my own agenda. I felt well rested, averaging 9+ hours of sleep a night- boy did I need that! It’s amazing how much better you feel when you are well rested…. who knew?! 🙂 Fast forward to this current week, and I’m slacking in the sleep department. New job + longer commute + same training = less sleep + a tired Kristin. I know I will get in a groove, but this week has been hard! I need to figure out a solution soon because training is going to really start ramping up! Ok here’s what I was up to last week, when I had all the time in the world to get my training (and recovery) done. Wednesday + Friday Masters Practice! Feeling fantastic in the water. I’m continuing to lead sets for my lane and I’m gaining confidence week after week. Tuesday + Thursday = Intervals! Each workout 1:00 hour long for intervals. I had to get up nice and early and ride, because of Easter Sunday. I did my long run the day before, but my legs were surprisingly fresh! I didn’t even really have soreness. It was also a nice way to ‘shake out’ the legs after a long run day. This week I’ve been off from work, it’s my ‘transition week’ before starting my NEW job on Monday! I tend to forget that being home for a week can sometimes be more stressful than it is relaxing. I had a to-do list about a mile long.. from appointments to errands, the list was endless. The great thing about have a week off is, being able to fit my training in whenever I want, lots of flexibility. I’ve been sleeping a ton (yay!) and I’ve had extra time for TLC like stretching and foam rolling. Continuing to see progress and loving my time in the pool. Monday was a nice recovery swim. On Wednesday and Friday I went to Masters Practice. On Saturday, I did a 2,800 yard swim with focus on pulling and paddles:) My average pace at most of my Masters Practice’s is 1:27-1:30 per 100 yards. I am leading freestyle 200’s at 2:45 per 200 yards. I am able to hold a fast pace for a long period of time, which tells me I am getting efficient and very in shape in the water. Boo-yah! Coach Jorge has me biking on Tuesdays, Thursdays and Saturdays (for the most part). On Tuesday, I thought I was going to die during the workout, literally. I am doing intense workouts during the week to build my POWER! Needless to say, it’s not easy and sometimes I feel like puking. This was the most challenging bike session of the week… a lot of time in my ‘High Threshold’ zone which is roughly 160-166 bpm… holy smokes it was hard! On Thursday I did more of an endurance ride at z2 heart rate. Saturday was more of Z2, steady state heart rate, but for a longer period of time (2.5 hours). I finally found a new Netflix series that makes the time go by, Bloodline. You should check it out! Running mileage ended up being low last week. I was supposed to do my 21 mile long run, but my body had different ideas. My legs were not feeling the long run, and I listened to them. As a result, I did some 30 minute easy runs during the week and moved the long run to this weekend. Instead of my long run on this past Sunday, I rode my bike for 1.5 hours and then did some water running for 45 minutes. Water running is NO joke! Talk about sucking wind. After my Sunday training sessions, Todd and I went to the TriMANIA Expo in Boston. It was fun to walk around and see different triathlon vendors! We didn’t end up listening to any of the speakers, unfortunately. My FAVORITE part of the expo was trying on the Normatec Recovery Boots. I’ve been wanting to try these boots for years now and I finally got the chance. We waited in line for maybe 10 minutes and then had the boots on for roughly 20 minutes. They feel unbelievable. I describe it like having a blood pressure cuff around your legs, that’s massaging you from your feet to your hips… mmm soo good! The science behind Normatec is fascinating.. you can read all about it here. I would love to own a pair of these bad boys one day! Have you ever tried Normatec boots? Do you like water running? Last Saturday I ditched my bike workout for a hike instead! I could not have been happier with this decision, coach approved of course:) Truth be told, if I were not training for an Ironman, I would probably hike every single weekend. We were a little weary of the conditions, since it was supposed to snow Saturday in Massachusetts, but saw that in New Hampshire conditions looked pretty calm, so we took a chance. The White Mountains (aka The Whites) are about 2.5 hours from where we live in Mass, so the conditions can vary drastically from one location to the other. Usually it’s more stormy in the mountains, but this time it was the reverse. We lucked out with temps in the 30’s, no wind, and perfectly well-packed trails. Even though it was a cloudy day, visibility was still very good. It’s always a gamble when you hike in the White Mountains (or any mountain for that matter). Of course, it’s nice when you have one of those ‘bluebird sky’ days, but sometimes the cloudiest days make for the most beautiful hikes…and the starkest contrast. This was the case with Cannon on Saturday! We picked Cannon mountain because it’s known for it’s views, challenging trails and it’s a convenient location with lots of parking (right off the highway). Also we had never done this hike before and we are working on our 48 list. The plan was a 9:30 AM start with Todd, our friend Steve and our two pups. Cannon is also a Ski Mountain, but where you hike is on the other side (not up the ski slope:)) I had always heard the conditions on Cannon can be very treacherous (steep trails, high winds), so we lucked out with the conditions we had on Saturday. There are a few different ways to hike up Cannon. We chose the Lonesome Lake Trail to the Kinsman Ridge Trail. This trail approach was 3.1 miles one way, equaling 6.2 mile round trip. 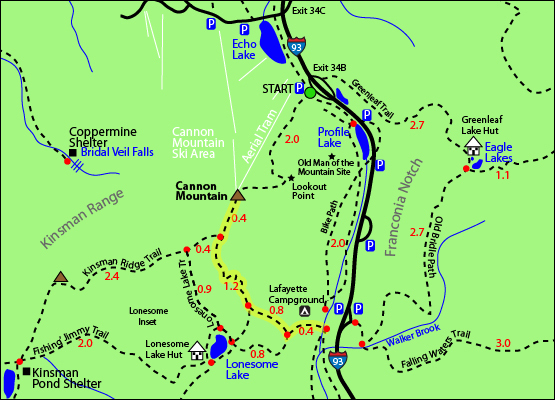 At the start of the hike, the Lonesome Lake Trail climbs moderately, until you reach Lonesome Lake. When we got there, we were literally the only people at the lake, it was so peaceful! It was approximately 1.2 miles from the Lafayette Campground parking lot to the lake. It actually climbs quite steadily the entire way to the lake, which I wasn’t expecting (ensue quad burning). We enjoyed a quick snack and continued on our way towards the Kinsman Ridge Trail. The Kinsman Ridge trail continued on for 1.9 miles until reaching the Cannon Summit. Honestly, this trail did not really let up, AT ALL until we got .5 miles from the observation tower. At some points it was straight vertical and it felt like it was the steepest trail I’ve ever hiked (seriously). We wore microspikes over our hiking boots, which helped with traction. Snowshoes weren’t needed as the trail was completely packed down. We had wished we brought out more serious crampon spikes for the VERY steep and icy sections. Todd actually had to carry Oliver at some points because it was too steep for the little guy! It was almost too steep for us too, ha! When the trail is super steep like this, it’s a constant calf stretch, at least it feels that way. I’m also pretty sure I was working at a high heart rate for most of this hike, definitely anaerobic most of the time going up. Here are some of my favorite photos from the day… it’s more fun with a go-pro and a selfie stick! The Summit has a great look out tower, which made it extra special. Views were 360 degrees and we had a clear view of Franconia Ridge in the distance. Snowy pup… Oliver is wearing his Ruff Wear Quinzee jacket over his Ruffwear Cloud Chaser Jacket. For his little paws, we have Pawks socks underneath, with PAWZ rubber booties on top. I’m happy to say we’ve finally found the perfect combination for keeping him a warm & happy pup! The way down was A LOT faster than the way up. Partially because we slid on our bums going down for some of the steep sections… dangerous, but fun! I don’t think I could have gone down without sliding on my a$% for part of the way. I actually slipped at one point, while trying to walk down the trail and ended up crashing down, my leg whacking against a tree. Luckily I just walked away with only some scrapes and bruises. Winter hiking can be dangerous, and you have to be so careful (and VERY prepared). Conditions can change within an INSTANT you need to have extra clothing and supplies on hand. We keep our water in our packs this time of year so it’s doesn’t freeze. After four hours in the woods, we reached the parking lot. What a fantastic day it was! We reached out 37th 4,000 footer (Oliver reached his 34th! ).